Shalom Senara is the new Manager of the Manu Samoa Sevens team. The appointment of the Samoa Rugby Union’s Development Coordinator to the new role was confirmed by the Union yesterday in a statement. Why she “stepped down” after only a couple of months and even before the H.S.B.C Sevens Series has gotten underway could not be ascertained. She could not be contacted for a comment yesterday. 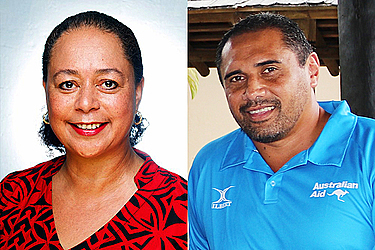 But in a statement, the Samoa Rugby Union C.E.O, Faleomavaega Vincent Fepulea’i, said that Senara’s appointment was endorsed by the Board last week. “We are delighted for Shalom to have him assist Sir Gordon and Steven Betham lead our Sevens programme into a very important year for our 7’s campaign with the Commonwealth Games, the 7’s World Cup and the H.S.B.C series,” Faleomavaega said. Senara’s appointment is effective immediately and S.R.U will be advertising the role of Development Coordinator shortly. Leuluaiali’i Theresa Passi became the Manager in July. “I am excited and I’m looking forward to the many challenges that will come my way,” she said when he appointment was announced. Sir Gordon Tietjens, Samoa National 7’s team Head Coach also congratulated her. The Chief Executive Officer of the S.R.U also confirmed the appointment of former Manu Samoa and World Rugby Hall of Famer, Muliagatele Brian Lima as the Assistant coach of the Manu Samoa 15s. Another appointment is that of former All Black and Manu Samoa player, Soifua John Schuster as Manu Samoa’s Technical Advisor. According to the C.E.O, the S.R.U is still working to complete Head Coach, Fuimaono Titimaea Tafua’s management team. Fuimaono was recently re-appointed to take over from former coach, Namulauulu Alama Ieremia, who resigned less than a year into his contract. Coach Fuimaono is currently travelling with the Samoa A for a tournament in Uruguay.